If you live in Fairfax, and looking for a company that fix and replace broken garage door springs, you got to the right place. We offer same day spring repair or replacement for commercial and residential overhead doors. A broken spring, whether it is a torsion or extension spring, is of the most common garage door problems. When a garage door spring snapped, the door cannot work, until you replace the broken spring with a new one. 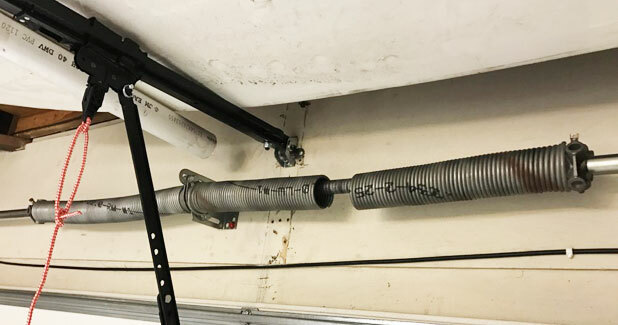 There are many reasons that lead to a broken garage door spring, but it seem that lack of garage door maintenance which should be performed at least every six months is one of the main reasons. And since we learned that it is the most common reason, we highly recommend, to provide your garage door with a maintenance service, at least every 6 months, to make sure that door will continue to work in a perfect way for many more years. What to do if the spring snapped? A snapped spring is not the end of the world, and with the right repair, your garage door will work again today. 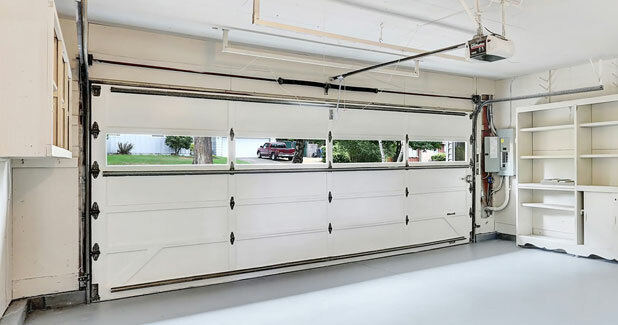 All you need is a trained garage door repairman that know how to match the right spring for each Overhead door. If the spring of your garage door is broken, or if you think that the spring need an adjustment, we highly recommend that you stop using the door, and call a garage door company in Fairfax Virginia. If you will continue to use the damaged door, not only that you will make the problem worst, but it can be dangerous to you, or to those who uses the garage door. A broken garage door spring does not mean that you need to replace the garage door. All it means is that you need to replace the spring, which is a job that can be done by any garage door technician, as long as he is professional and experienced. We got the knowledge and the experience to find the right spring for your garage door, torsion or extension. What type of spring do I need? Whether it is a torsion garage door spring, or an extension spring that need to be replaced, it is important to wait for the repairman to fix the spring before using the door again. Our garage doors technicians, have successfully fixed and replaced hundreds of garage doors springs in Virginia. They have the experience to fit the door with the right spring, that will bring it back on track again, and that will help the garage door work in the perfect way that every garage door should work. A torsion spring replacement, can be a simple job, and can be a complicated job. A lot depend on how professional the repairman is, and how complicated is the replacement. There isn’t much you can do if one (or both) of your garage door’s torsion springs snapped. The best thing for you to do is to contact a garage door company that offer same day garage door repairs in Fairfax Virginia, to come to your house or your business and replace the spring with a new one. If you are going to ignore our recommendation to stop using the door, and you will try to open it using the opener, it is only a matter of time before the opener will burn, the second spring will also break, or any other problem that can happen when using an unsafe garage door. But more important than that, is the fact that using a garage door although the spring snapped is dangerous, and the door can hurt someone. If your overhead door is equipped with extension spring system (The can be found on the sides of the overhead door, and usually installed on top of the steal tracks), and one of the springs snapped, you shouldn’t try and use the door before the spring will be repaired. We carry with us extension springs from different overhead doors sizes and weights, because we know how important it is for you to get your door repaired and working again as soon as possible. So moist likely that we can repair your garage door today. DIY spring replacement. Is it really safe? We always say that there are some garage door repairs that can be done in DIY, and that there are some which are better to be left for a professional repairman. The spring replacement comes in the middle, and some can be performed in DIY, and some are too complicated to be repaired by a handyman who isn’t experienced enough in the garage door industry. There is one rule that follow all the DIY garage door repair, whether it is an overhead door repair in Washington DC, or a spring repair in MD: Always make sure that you follow the safety rules, and never take unnecessary risks, because there is no money in the world that worth your health, and the safety of your family. If you plan to replace a torsion spring by yourself, we suggest that you rethink it. A torsion spring require certain tools and knowledge that can be learned after many torsion spring replacement and repair. There are many Videos online that explain how to replace torsion spring, but that doesn’t mean that you can follow the Video and replace your torsion spring by yourself. What seem easy on YouTube, can be difficult and dangerous in real life. If you decided to go ahead, and install the new torsion spring by yourself, make sure you will locate the right spring for your door. And not one that seem to be the same. You may find the exact spring like the one you had before, and most likely that it will make the door work, but when you think about locating the right spring, purchasing the right tools (There is no safe replacement for torsion sticks), removing the spring, adjusting it etc. For the safety of you and your family, contact a garage door company to replace it for you. Off tracks garage door Virginia. Roll Up Door spring repair Virginia.